Enjoy a schooner cruise aboard the Mary E.
You’d expect Essex, Conn., to be picturesque — after all, it’s been named “The Perfect Small American Town” in the book “1000 Places to See Before You Die,” and claimed the top spot in a compilation of 100 best small towns in America. But what you might not expect is how “ye olde” this town of 6,697 feels. Walk down Main Street and you’ll encounter the Griswold Inn, built in 1776 and seemingly frozen in time, with its potbelly stove and collection of 15th-century firearms. Keep meandering toward the Connecticut River, and you’ll pass by a collection of Federalist homes so impeccably maintained, they look like a movie set. Soon, you’ll reach the Town Wharf, where — if you time it right — you’ll see the historic 1906 schooner Mary E cruising past. Adding to the “past is present” aura: a steam train, a riverboat, and the delightful, 280-seat Ivoryton Playhouse, where Katharine Hepburn once took her bows. Ivoryton is one of the three villages (the others are Essex and Centerbrook) that make up the town of Essex. Situated on the west bank of the Connecticut River, and just 8 miles north of Long Island Sound, Essex was a major shipbuilding port between the Revolutionary and Civil wars — so important, the British raided the harbor 200 years ago last month. Some 28 ships were burned to ashes, marking one of the worst losses America suffered during the War of 1812. These days, most visitors have sightseeing, not mayhem, on their minds, as they explore the river valley and town-hop to attractions in neighboring burgs. But you’ll find plenty to do right in Essex, especially if you’re in the mood to travel back in time. Framed by its namesake tree, the sunny yellow, circa 1889 Copper Beech Inn (46 Main St., Ivoryton; 860-767-0330; www.copperbeechinn.com; age 16 and over; dog-friendly; from $159-$379) is warm and welcoming. The new owners have restored guest rooms — there are 22, set within the main inn, carriage house, and the newer Comstock House — and they’ve upgraded the dining in a big way. Their popular “Raise the Curtain” package includes two tickets to the nearby Ivoryton Playhouse, a $100 dinner credit, and breakfast. Set right on Main Street in Essex Village, the circa 1776 Griswold Inn (a.k.a. the Gris; 36 Main St., Essex; 860-767-1776; www.griswoldinn.com; from $115) is one of the oldest continuously operated inns in the country. The place is pure nostalgia, from the Currier & Ives steamboat prints to the handsome Tap Room (dating to 1736, and the original Essex schoolhouse). Bringing the kids, or prefer a beach resort experience? The sprawling, lively Water’s Edge Resort & Spa (1525 Boston Post Road, Westbrook; 800-222-5901; www.watersedgeresortandspa.com; rooms from $129; villas from $750) is spread over 25 acres of manicured lawns that lead to a private sandy beach on Long Island Sound. Kids will encounter their own tribe playing organized activities, and there are always plenty of families at the outdoor pool. The 187 guest rooms include suites, villas, and summer cottages; on-site restaurants make the most of water views. The kitchens at local inns do their best to entice diners with ambitious menus that feature locally sourced ingredients, and prices that typically start at around $24 for an entrée. (For something more casual and less pricey, like steak frites, opt for dinner at the bar.) The Griswold Inn (see above) is known for classics like baked stuffed shrimp with seafood filling ($25) and New England lobster pot pie (market price), while chef Gaspar Stantic’s menu at the Oak Room restaurant at The Copper Beech Inn (above) leans toward the artful, creative side. Its gluten-free bread is the best we’ve tasted, and the pan-seared local scallops with lobster corn risotto ($26), on its current menu, wins raves. Neighborhood favorite Gabrielle’s (78 Main St., Centerbrook; 860-767-2440; www.gabrielles.net; $12 and up) officially offers Mediterranean-fusion cuisine, but dishes run the gamut from Mexican pizza to Spanish tapas. For lunch, join the yachties who dine on the shaded patio at Abby’s Place (37 Pratt St., 860-767-0560; www.abbysplacect.com; from $11), tucked alongside the marina. Water views will make the long-ish waits for breakfast, lunch, or brunch more tolerable. Abby’s fresh, from-scratch cooking includes a very popular hot lobster roll (the meat is sautéed in clarified butter) on a toasted brioche roll ($21). Looking for something tasty to take out, perhaps for a picnic at the town park? Pick up a sandwich or a wrap at Olive Oyl’s (77 Main St., 860-767-4909; www.oliveoylscarryout.com; from $5.75), where they give props to Massachusetts with chocolate from our own Taza and ice cream from the Berkshires’ SoCo Creamery. Shop at the Christmas Barn. 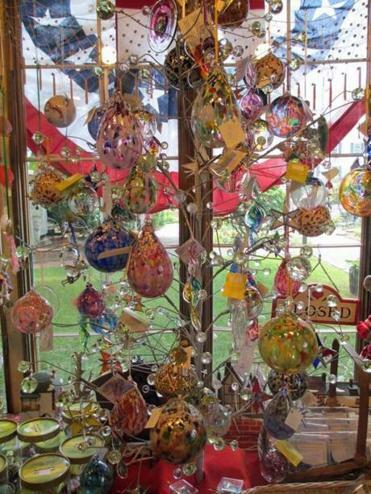 (4 Griswold Square, 860-767-1181; www.christmasbarnessex.com), jam-packed with ornaments (check out the tiny Chuck Taylors) and nautically themed ephemera at Goods & Curiosities (47 Main St., 860-767-0210; www.griswoldinn.com/the_store) as you admire the beautiful collection of period homes. One of the seasonal delights of this fetching river town is a Connecticut River cruise aboard the schooner Mary E, offered by the Connecticut River Museum (67 Main St., 860-767-8269; www.ctrivermuseum.org; $30; 12 and under, $18; includes admittance to museum galleries and exhibits; June-October. Museum only $9; 6-12 $6). The sail lasts 90 minutes, and includes narration from the (delightfully salty) captain, and pretty views. Or, opt for a two-hour sunset cruise ($35); bring a picnic. 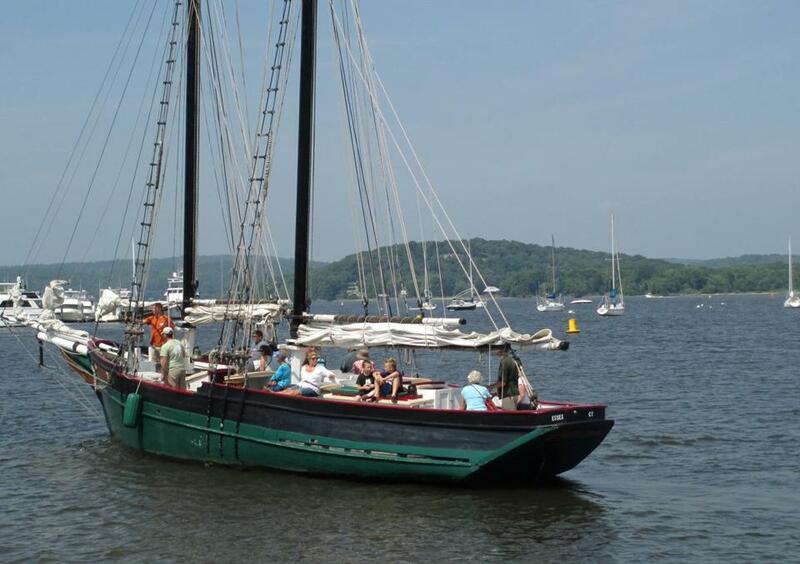 Even if you pass on the schooner trip, visit the Connecticut River Museum; it offers an interesting look at this long tidal river, past and present, including current ecological challenges. The most easygoing tour around, the Essex Steam Train & Riverboat Ride (1 Railroad Ave., 860-767-0103; foliage season rides, through Oct. 26, Thurs.-Mon. Steam train and river boat, $28; ages 2-11, $19; steam train only, $18, 2-11, $10; www.essexsteamtrain.com) offers the choice of a one-hour ride on a vintage steam locomotive, or a 2½-hour ride via rail and the riverboat Becky Thatcher. On the outdoor recreation side of things, there’s 137-acre Bushy Hill Nature Preserve (Bushy Hill Road, Ivoryton; www.essexct.gov), a former pasture laced with color-coded trails, and river paddling (simplest if you BYO boat and use one of several public boat ramps). The closest major beach is Hammonasset Beach State Park (1288 Boston Post Road, Madison; 203-245-2785 www.ct.gov/deep/Hammonasset; $22 per vehicle for nonresidents), the longest public beach on the Connecticut coastline, about 20 minutes away. There’s also a small town beach in Westbrook. 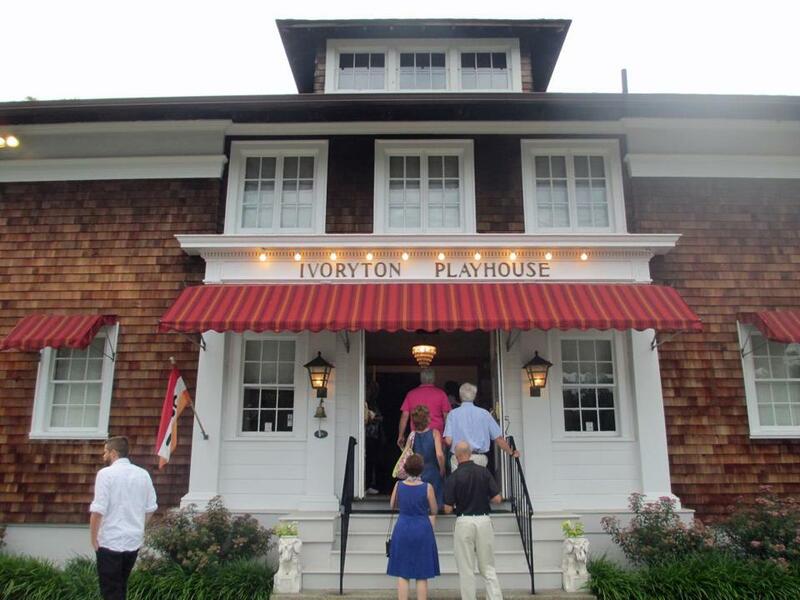 Take in a show at the Ivoryton Playhouse. (15 Main St., 860-767-0233; www.theblackseal.net), where a draft beer goes nicely with the fried oyster po’ boy sandwich. Meanwhile, the Water’s Edge Resort and Spa (see above) offers musical theme nights devoted to names like Frank Sinatra and Barbara Streisand. Essex is 124 miles southwest of Boston. For information, visit www.ctvisit.com.